The concept of massive open online courses, known as MOOCs, were first introduced in 2008. MOOCs are online courses aimed at unlimited participation and open access via the web. AMAC Accessibility Solutions & Research Center at Georgia Tech has dedicated their expertise and resources to develop a MOOC that focuses specifically on Information and Communication Technology (ICT) Accessibility. In collaboration with G3iCT and Georgia Tech, AMAC is proud to announce that the course is now available on the edX platform. This MOOC offering is comprised of a six-week course that identifies issues and design solutions for Information and Communication Technology (ICT) Accessibility. What Does the ICT Accessibility MOOC Provide to Your Organization? This course consists of modules detailing some of the primary ICT accessibility obstacles that organizations face. This introductory course will provide your agency with an overview of how to measure its ICT accessibility and assess the importance of maintaining an inclusive workplace for both employees and customers with disabilities. No previous knowledge is required. Participants are expected to have a working knowledge of common computer-based applications such as the Microsoft Office Suite. Students of this course will learn about the fundamentals of accessibility design in the ICT field. At the end of the course, students will be able to identify, evaluate, and apply strategies and techniques for making electronic information and communication technology services and products accessible for employees and users in corporate, governmental, and not-for-profit organizations. Summarize the foundations of ICT accessibility. Summarize the principles of accessible ICT design. Identify the uses of assistive technology. Create accessible documents and multimedia. Evaluate and repair websites for accessibility. 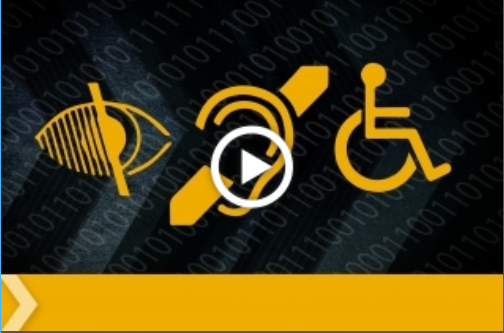 Identify components of ICT accessibility operations. Background information on ICT accessibility and the future of electronic information accessibility. The importance of design in accessibility, the value of container and content, and the evaluation of compliance. Impact of assistive technology on individuals with disabilities, federal laws related to assistive technology, definition of mainstream technology, and assistive technology demonstrations. Elements of an accessible document, accessibility standards, tools to check accessibility, multimedia captioning and audio description demonstration, audio description standards, guidelines, and resources. Web accessibility definition and overview, understanding interaction of web and users with accessibility needs, evaluating accessibility issues via online tools, remediation of code in order to achieve website accessibility, and contribution of HTML5 and ARIA to website accessibility. The influence of market forces on the development of enterprise ICT accessibility operations, challenges faced by these enterprises, Enterprise ICT accessibility operational model and how it can sustain enterprise accessibility operations. Each module includes recommended and suggested activities for deeper exploration and learning of the content. AccessGA, Georgia’s Accessible ICT Initiative, is a program of the State of Georgia ADA Coordinator's Office, AMAC Accessibility Solutions and Research Center at the Georgia Institute of Technology, and the Georgia Technology Authority's GeorgiaGov Interactive.